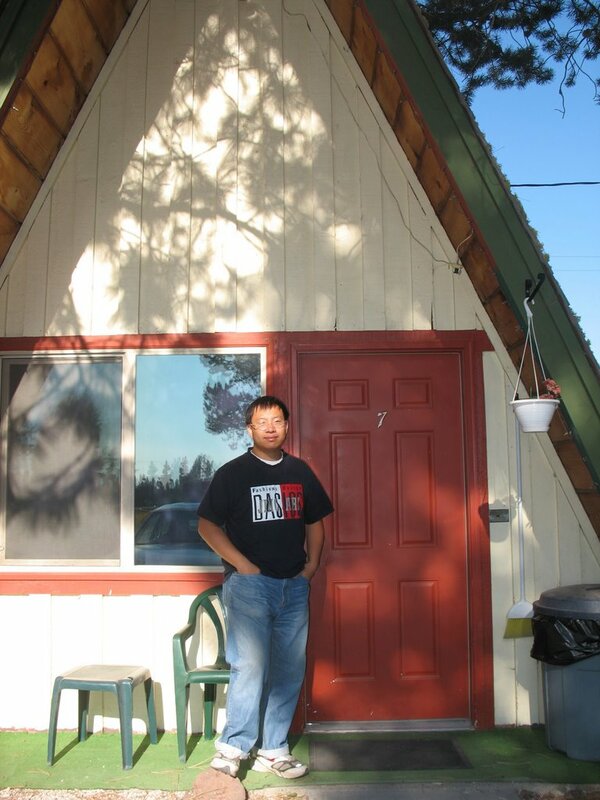 In the summer of 2006, I attended my cousin's wedding up in Portland, OR. 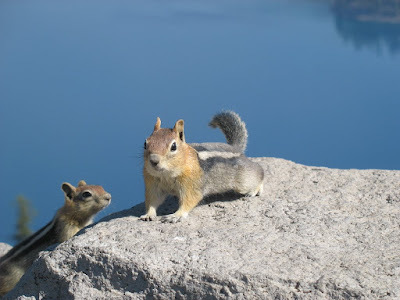 Since my mom flew in early, it presented me the golden opportunity (and excuse) to bring her on a trip to Crater Lake National Park. 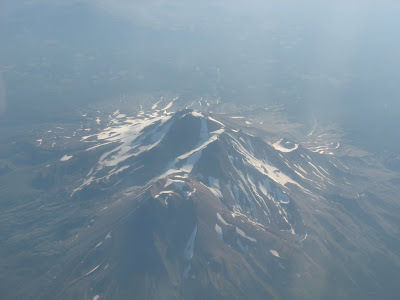 This is a view of Mount Shasta from the plane above. In the Cascades Range, it is the second highest peak, just behind Mount Rainier. If you happen to be driving on I-5 in northern California, you cannot miss it. Here, I got a much different perspective. My trip to Portland was extremely hectic. Not only did I have to pack for the trip, more importantly, I had to finish up moving into another graduate dorm room the night before, literally. The next morning, I had to catch an early morning flight. Immediately arriving Portland and a brief power nap later, I was on the road with my mom (thanks to my aunt lending us a Camry). I did not have a GPS, and I only had a few AAA maps and books and some directions I scribbled down. I vividly remember that the first night's accommodation was booked when I was at the Portland airport, waiting for my aunt and mom to pick me up. I was happy with the location and price and I went ahead with it. The place we stayed at was called the Holliday Village Motel. On US-97, it is just past the town of Chemult, if it can even be called a town at all. The motel is literally in the middle of nowhere, which translates to: it is much closer to the park than the nearest big town, without spending big bucks by staying in the lodges inside the park. The units here at the motel are simple A-frames. It's very simplistic but it has pretty much everything you need to stay the night. One thing I didn't expect was the number of television channels (200+) that they had in the room. The only little caveat is that the shower tubs are next to the slanted roof, meaning that you cannot fully stand up when showering, because you will certainly bang your head into the roof. 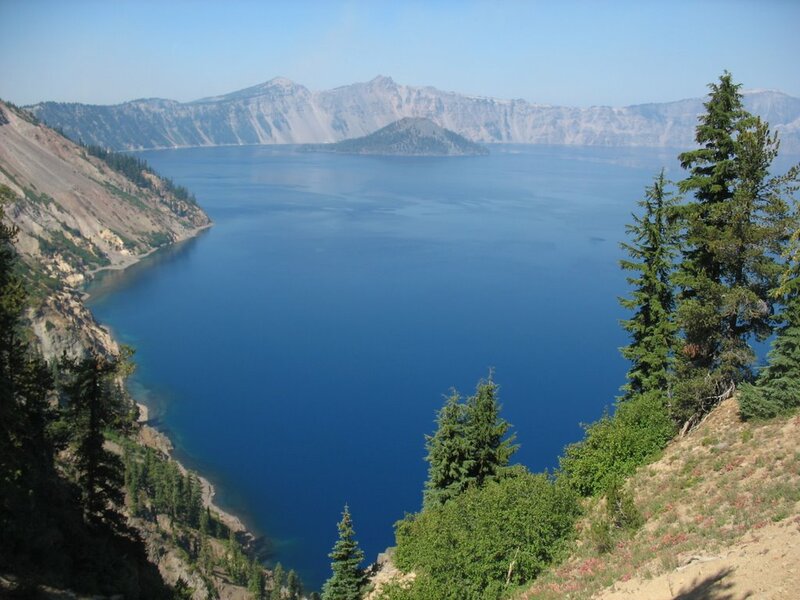 Crater Lake was formed when the ancient Mount Mazama started to collapse around 7000 years ago, after many violent eruptions. Mount Mazama itself was created around 500,000 years ago by a series of volcanic activities itself. About 30,000 years ago, the underground lava became rich with silica, meaning that the lava was more viscous, which also means that gases cannot escape so easily, and pressures can build up. This also signaled that the eruptions would become more and more powerful, which ultimately reached the climax 7700 years ago. 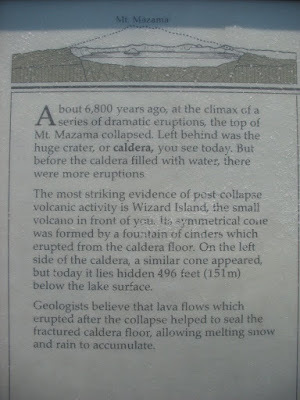 With all the lava and pressure released, Mount Mazama started to lose support and collapsed, creating a caldera. 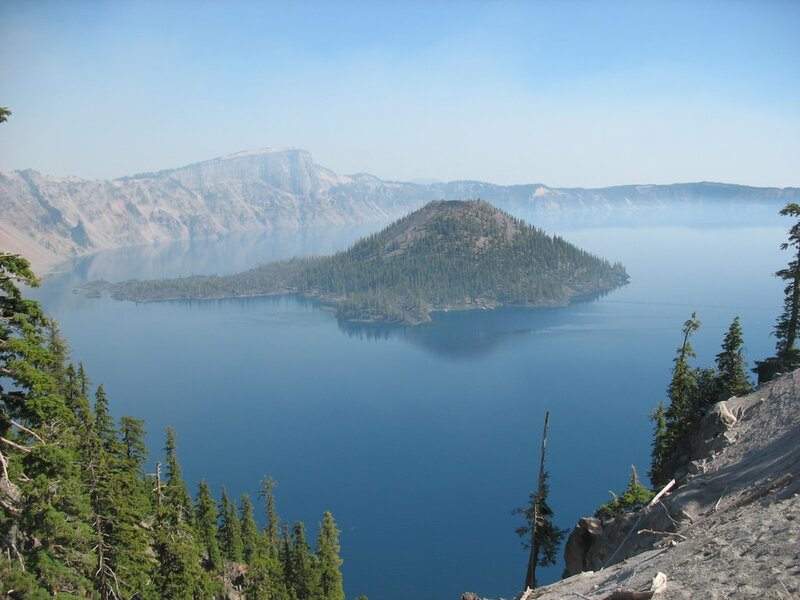 That was not the end yet, as many subsequent eruptions took place after, creating secondary volcanic domes that rose from the floor of the caldera. Geologists believe that the lava flowing out hardened and created a non-porous rock layer, a closed seal that would not allow water to seep out. The lake filled up through precipitation of snow and rain, where the water level has remained more or less constant for the past hundred of years. Today, Crater Lake is the deepest lake in the United States (maximum depth of around 1949 feet), the second deepest lake in North America, and the ninth deepest lake in the world. It is known for the clarity of the water, since it gets its water mostly from snow, so there are very few pollutants in the water. 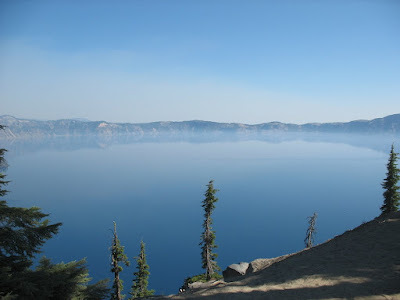 In fact, Crater Lake has a record clarity of 43 meters as set by a Secchi disc. The lake also owes its mesmerizing deep blue color to that of the purity of water. Water molecules have a dip in the absorption spectrum in the blue wavelength, where the blue light is scattered and reaches the surface. 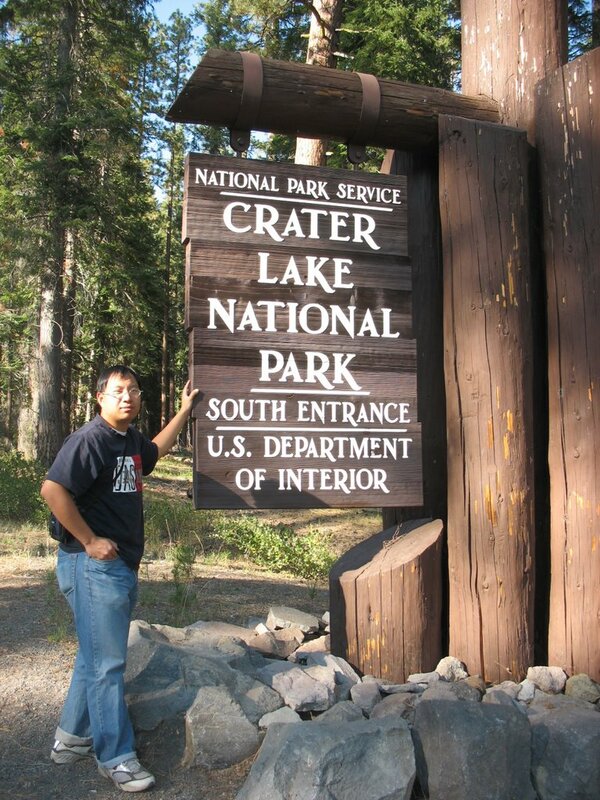 Established in 1902 (under Teddy Roosevelt, yet again), this is the sixth oldest U.S. National Park. It also happens to be one of the snowiest places in the Northwest. This implies that there is only a small window per year where the park is completely open. This window is typically the 3 months between June and September. Otherwise, expect lots of snow and a closed Rim Drive. There are two entrances into the park, one in the north and one in the south. Coming from Portland, naturally we'd be coming in from the north. Upon hitting the Rim Drive, we chose to drive around the lake counterclockwise. 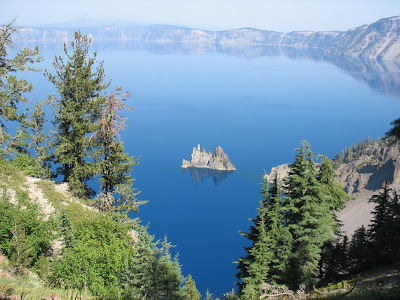 One of the first features you will see is Wizard Island, one of the two geological formations that are above the water line (Phantom Ship being the other). 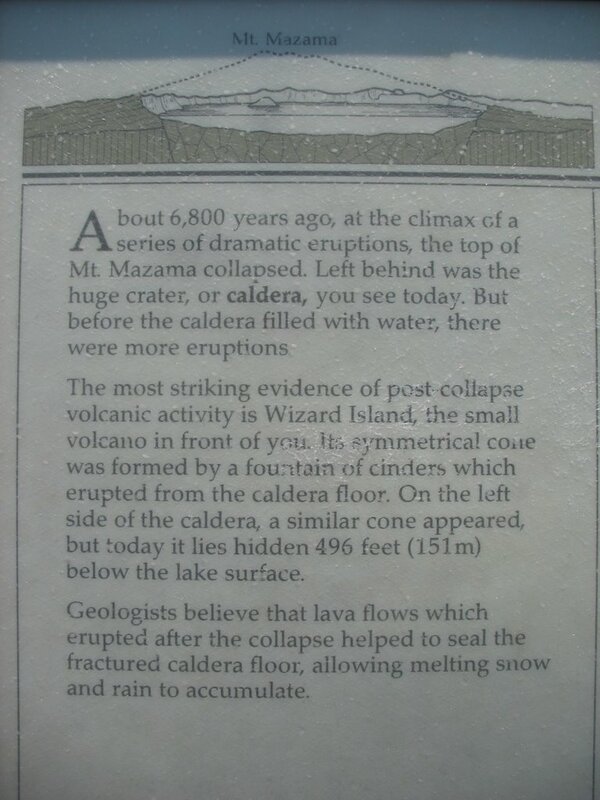 Wizard Island was created by the aforementioned subsequent eruptions after the collapse of Mount Mazama. We were very lucky that the lake was very calm this morning. Originally thinking that there was alot of fog near the surface of the lake, a closer look reveals that they are in fact the reflections of the surrounding peaks! Remember that is is illegal to feed animals here. 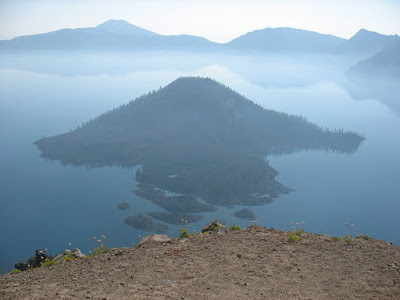 Phantom Ship comprises of the oldest rocks in this area, when Mount Mazama was created 400, 000 years ago. The rock is pretty different from its other nearby formations, and it's somewhat evident from the color and texture (compared to Wizard Island). The name comes from the fact that it loosely resembles a ghost ship sailing in the ocean. I guess you can judge for yourself. The Rim Drive is only 33 miles long. If you take your time, stop at all the stops and stroll around, you can probably still finish touring the area in less than half a day. However, the Rim Drive is not anywhere near the lake shore. The only hiking trail that does bring you to immediate contact with the waters is Cleetwood Trail, which is a steep descent and ascent. It is also where you start to go for boat rides on the lake. With my mom not feeling physically fit at the time, we decided not to do any serious walking. There are other easy hiking trails on the rim less than 1 mile that brings you to the various lookout points. 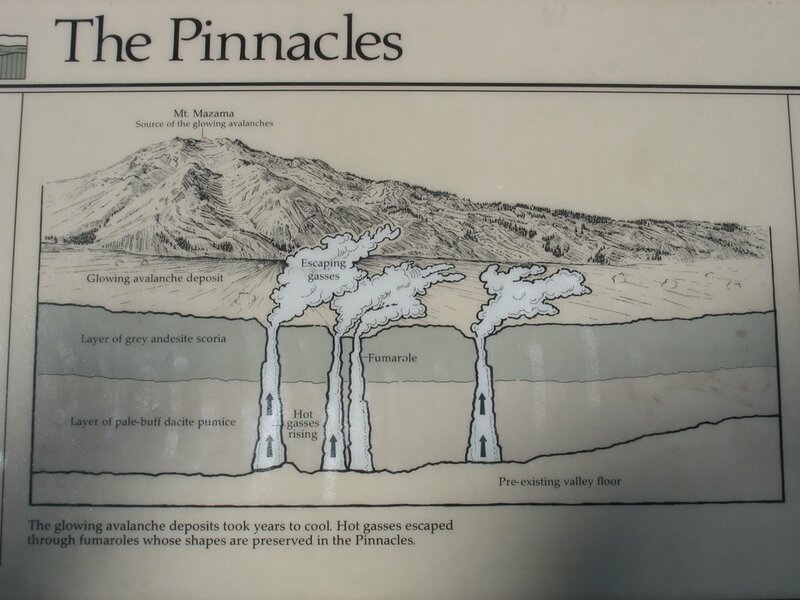 The Pinnacles are located in the southeast end of the park, where you make a turn off Rim Drive. There is only one road leading there, which is a dead end anyways, so you can't really miss that either. 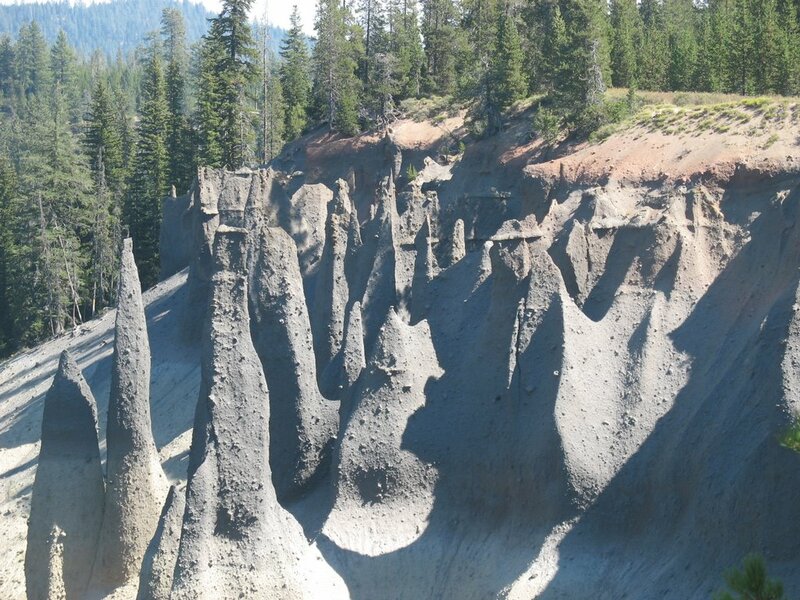 When Mount Mazama erupted, fast-flowing pumice lava flowed down into the valley floor nearby (6 miles approximately). A secondary flow of andesite lava later covered the initial pumice flow. 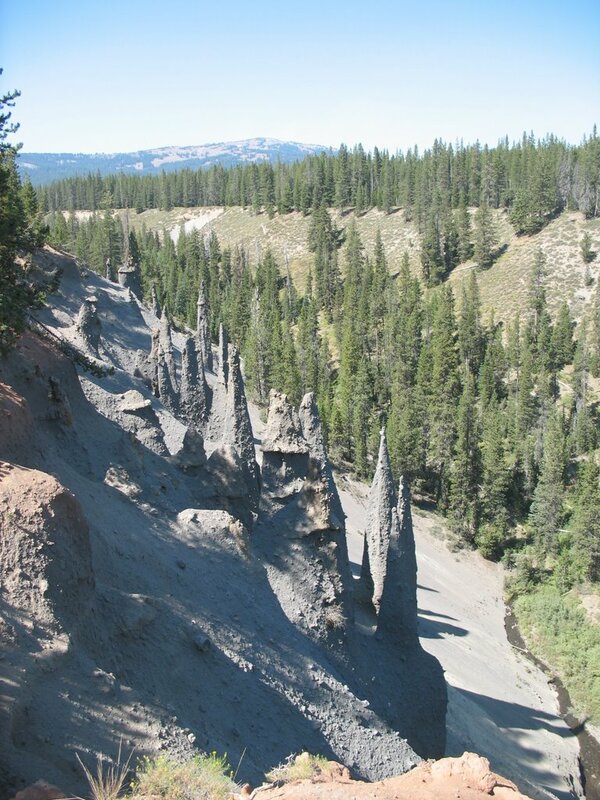 Pumice lava traps many gases, which started to make their way up to the ground, creating cone-shaped fumaroles. 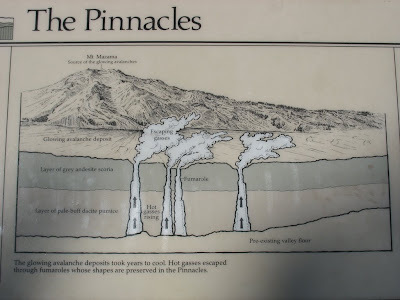 Many years of erosion have stripped away the rocks and have exposed the hardened gas tunnels. Naturally, these pinnacles are hollow within. I was simply bedazzled by how blue and clear Crater Lake was. I would return two years later, taking the hike down to the lake shore and enjoy the boat trip on the lake. 六月通常只有West Rim Drive能開車, 一般得到六月底或七月初才會全線暢通, 而且Ranger Programs也才會正常運作. 一般十月中後會下雪, 可能就在這個月關閉Rim Drive, 也可能十一月才關, 視下雪量而定.